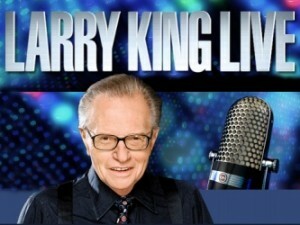 CNN’s Larry King Hosts Special Two Hour Larry King Live Telethon Monday, June 21… “Disaster In The Gulf: How You Can Help” from 8 to 10pm Eastern. (LOS ANGELES) June 18, 2010—CNN original Larry King hosts a special two-hour Larry King Live telethon this Monday, June 21, “DISASTER IN THE GULF: How You Can Help,” from 8 to 10pm Eastern, a star-studded effort to raise funds for United Way, The National Wildlife Federation and The Nature Conservancy, organizations working directly with the families, individuals and Wildlife affected by the Gulf oil spill. Guests include Jalen Rose, Justin Bieber, Deepak Chopra, Cameron Diaz, Philippe Cousteau, Ted Danson, Kathy Griffin, Chelsea Handler, Randy Jackson, Kerry Kennedy, Sammy Kershaw, Lenny Kravitz, Jenny McCarthy, Tim McGraw, Alyssa Milano, Aaron Neville, Edward James Olmos, Victoria Principal, Robert Redford, Gloria Reuben, Tyson Ritter, Richard Simmons, Ian Somerhalder, Sam Trammell, Melania and Ivanka Trump, Pete Wentz, with a special performance by Sting. Guests talk with King on set and via satellite and also participate in the program’s telephone banks taking viewer calls, or in a special online Social Suite—hosted by Ryan Seacrest—for participants using internet social media such as Facebook and Twitter. Celebrity guests post live Facebook updates during Monday’s telethon and the hashtag #CNNHelpGulf is used for viewers and online participants wanting to join the conversation on Twitter. CNN’s Anderson Cooper, Soledad O’Brien, Kyra Phillips and Rob Marciano provide the latest news from the Gulf throughout the 2-hour live telecast, with reports from locations including New Orleans, Grand Isle, and other areas throughout the region. King also welcomes 11-year old special guest Olivia Bouler from Islip, New York, who made news with her effort to protect birds in her native Southern Alabama by providing original watercolor paintings of regional birds to anyone who donated to organizations working to protect Gulf wildlife. She has raised over $20,000 to date through her efforts benefiting groups such as the Audubon Society, Sierra Club, Weeks Bay Foundation, Mobile Bay Estuary Program and the National Wildlife Fund. Bouler paints a picture during Monday’s telethon to auction for viewers, with proceeds going directly toward the evening’s fundraising efforts. CNN.com/ImpactYourWorld offers users and viewers ways to help, with highlights from organizations seeking volunteers, links for direct donations, tips for helping for those who can’t travel to the Gulf, iReporters’ solutions for the cleanup, a live on-page update of what people are saying in the Twitter world on #CNNHelpGulf as well as celebrity videos and more. CNN also offers the option of mobile giving for telethon viewers with individuals able to give via mobile phone text message to the United Way, The National Wildlife Federation or The Nature Conservancy. Text message donation codes for the organizations involved are announced during the CNN telethon. President Obama says the government is holding BP and all other responsible parties “accountable” for what’s become the worst environmental disaster in U.S.history. He also says he’s “absolutely confident” BP will be able to meet its obligations to the Gulf Coast and to the American people. The trouble is: Even if these pledges of “accountability” and “making things right” are completely fulfilled, it’s going to take time. And time is something theGulf Coast is very, very short on right now. Help is needed immediately – if not sooner. And it’s going to keep on being needed for a lot of years. It should be noted: Litigation arising from the Exxon Valdez spill took more than two decades to sort out. So long, many of the claimants died before their cases were resolved and the award checks were written. The United Way (one of the designated beneficiaries of the Larry King Live telethon) reports it’s already seen a “spike” in calls to its 2-1-1 lines in the Gulf and expects the number will keep climbing. While the latest tally of the Gulf wildlife dead – 725 birds, 324 sea turtles, 39 mammals – seems astonishingly small, experts warn the huge size of the spill means they probably will never be able to find more than a tiny percentage of the dead animals. There’s also the fear that the cycle of damage is just starting – there may be far worse to come. A grim hint of that “far worse” may be found in the 20th anniversary Status Report of the Exxon Valdez Oil Spill Trustee Council. In that report, the Council – set up to oversee the restoration of the ecosystem of Alaska’s Prince William Sound – lists only 10 of the 31 injured resources and services they monitor as “recovered.” What’s more, the Council says that thousands of gallons of spilled oil still persist in the once pristine area. Our immediate assistance in the face of the Gulf oil spill disaster – be it in the form of donating money or supplies, volunteering time, making environmentally responsible choices as consumers or working to raise public and political awareness – won’t heal the hurt right away. But it will help ease it. And it may prevent future pain to our people and our environment.